A thorough presentation of traditional penmanship for grades 5-adult. Includes historical background, plus detailed information on writing position, writing zone, paper movement and recommended sizes of writing. The single volume contains both a teacher guide and the student workbook/copybook. The thorough lesson plan guides the user in a straightforward, step-by-step progression to improve handwriting skill. Over 150 copybook sheets in the time-tested method of practice, boasting more than 375 model lines of writing and 1,575 blank lines for student use . Specially designed practice sheets featuring a progressive format of guidelines to focus the student’s efforts from basic letter size, height, spacing and slant to spontaneous writing upon a single baseline. 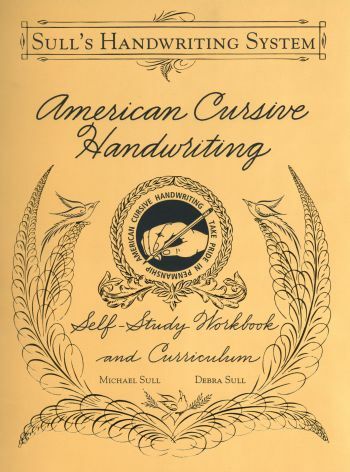 American Cursive Handwriting is similar to Business Writing or the basic, unstressed forms of Spencerian Script. Michael Sull is author of instructional books and DVD’s on Spencerian Script and Off Hand Flourishing.